Updated the banners, added a couple of new ones. Most notable new addition is ACES HIGH, by HiTech Creations. An on-line combat flight sim, which recently received a ground combat element and is currently being developed towards a full air-land-sea environment. Also of note is the complete overhaul of the discussion boards, finally fully integrating them with the rest of the site. I'm happy to see that this is working well. It could not have been done without the help of some users who were kind enough to report their experiences. Update of the Mighty Eighth Page, which basically is a straight port, however I did edit some text, added some tidbits, reading that old page sure brought back some ideas I once had on this topic, guess after redoing the old stuff I'll either end up with lots of inspiration for new pages and revamped versions of old ones, or...enter a period of being sick of the sight of a web page. We'll see, but to date I'm still enjoying myself. What my buddy Grega Rozman promises, he really delivers. Look and behold - the new rolling banner ad system. Normally not a big problem with scripts, but in this case my ISP does not allow open scripts from my type of account, so I asked his help...and this was what he made. 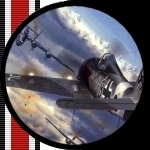 Okay, made the first true port of a page, the old Luftwaffe main page...IMHO it is an improvement. See more changes as the days go by...spare time and lovely girlfriend permitted. Don't forget...last but certainly not least...your questions for Peter Spoden of NJG 5 & 6. Make them good and I will pick out the best ones. Lets remember that we are lucky to able to ask a few questions at all! This has been a day of tweaking and messing around with editors, browsers etc etc etc. I can now say that the margins have been fixed, the page looks about the same on the latest browsers and is acceptable on the older ones. My buddy Grega is helping me with a funky ad system so...lets see. Looks like I've finally found a middle road between Microsoft's Internet Explorer 5.0, Netscape's Navigator 6.0 and Navigator 4.x, the last being a legacy browser. Unfortunately the N4.x version is the least attractive, but I managed to attain some level of communality, in the end 12 OCH! remains IE5 optimized. Think I finally cracked it, or at least almost. This page has been optimized for use with Microsoft Internet Explorer 5.0, but when using Netscape Navigator 6.0 will give you almost the same visual effect. Welcome to the world of differences. Well in this case I'd just love a single approach. The problem isn't HTML (if really knew how to use HTML, I wouldn't have had any difficulties), but editors which are optimized for either I.E. or another browser. The Page looks exactly as it did the 24th, however the butchering mess it made of Netscape is gone...a personal victory. Well, as long as you can call an extra day wasted a victory!